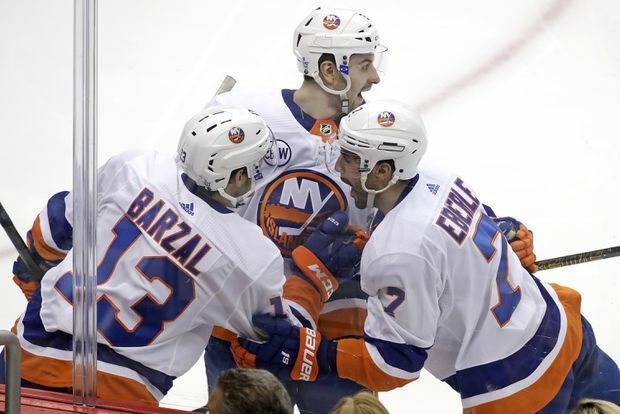 New York Islanders' Jordan Eberle celebrates with Adam Pelech, centre, and Mathew Barzal after scoring against the Pittsburgh Penguins on April 16, 2019. Momentum built slowly. A midseason surge under new head coach Barry Trotz gave them confidence. The goaltending of Robin Lehner and Thomas Greiss helped, too. Still, even a surprising second-place finish in the Metropolitan Division and the franchise’s best regular season in 35 years couldn’t stop the Islanders from being underdogs heading into their first-round series against Sidney Crosby and the Pittsburgh Penguins. Over the course of four games, the Islanders put on a defensive clinic that left one of the league’s marquee teams searching for answers and left little doubt their turnaround under Trotz is very real. New York finished off a sweep with a poised 3-1 win in Game 4 that propelled it to the Eastern Conference semi-final round for just the second time since 1993. The Islanders held Pittsburgh to just six goals, trailed for less than five minutes the entire series and didn’t buckle late in the clincher despite losing defenceman Johnny Boychuck and forward Cal Clutterbuck to injuries in the second period. When the final horn sounded, New York found itself shaking hands and moving on after needing just slightly more than 12 periods to bring Pittsburgh’s 13th straight playoff appearance to an abrupt and decisive halt. Or maybe more than a little bit. The Penguins – who know a thing or two about what it takes to thrive this time of year – didn’t exactly make excuses after getting swept in the first round for just the second time in franchise history. The Islanders were faster, more determined and more disciplined from the opening puck drop of Game 1 right on through. It’s the Islanders’ way, one that carried them into a second-round match-up against either Washington or Carolina. Trotz is well aware of a chance he could find himself facing the team he led to the Stanley Cup a year ago. Yeah, it might be a little weird. There are worse problems to have. Whoever faces the Islanders will have to find a way to successfully navigate a defensive system that forces opponents to go through wave after wave of players in search of open space. The Penguins rarely found any and, when they did, Lehner was almost always in perfect position. He stopped 135 of the 141 shots he faced and is getting a little tired of the notion what the Islanders are doing is a surprise. And the kind of thing the Islanders hope will carry over. They’ll have at least a week off before continuing a season that will extend at least into early May. Heady territory for a group that had just one playoff series victory since 1993 before taking out the Penguins.